The campaign coffers of Sen. Frank Lautenberg (D., N.J.) are running low, despite an apparent ongoing feud with Newark Mayor Cory Booker over his Senate seat. The New Jersey Democrat raised just $11,000 in the fourth quarter of 2012 and has a mere $182,000 in the bank, Roll Call reported Monday. For comparison, Roll Call notes, Sen. Mark Warner (D., Va.) raised $500,000 in the fourth quarter for his reelection campaign. Though the 89-year-old senator has not formally declared his intentions to seek reelection, his office has pushed back against Booker's nascent campaign. 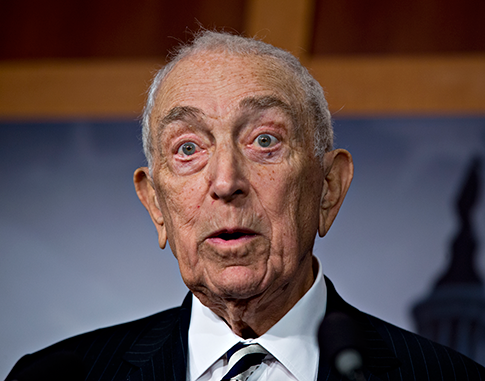 Lautenberg most notably compared Booker to a "disrespectful" child who needs "a spanking." Lautenberg has been candid in recent weeks, saying of embattled Sen. Robert Menendez (D., N.J.), "If there are infractions as they are reported, it’s too bad." This entry was posted in Politics and tagged Bob Menendez, Congress, Cory Booker, Frank Lautenberg. Bookmark the permalink.